For other places with the same name, see Wendover (disambiguation). Tooele County School District has completed Anna Smith Elementary School which serves the Wendover area. Wendover and Tooele County recently[ when?] built a joint complex for municipal and county functions. As of the census  of 2000, there were 1,537 people, 432 households, and 327 families residing in the city. The population density was 238.9 people per square mile (92.3/km²). There were 510 housing units at an average density of 79.3 per square mile (30.6/km²). The racial makeup of the city was 43.98% White, 1.17% African American, 1.76% Native American, 0.85% Asian, 0.13% Pacific Islander, 43.59% from other races, and 8.52% from two or more races. Hispanic or Latino of any race were 68.64% of the population. There were 432 households out of which 54.9% had children under the age of 18 living with them, 56.9% were married couples living together, 11.6% had a female householder with no husband present, and 24.1% were non-families. 16.7% of all households were made up of individuals and 3.5% had someone living alone who was 65 years of age or older. The average household size was 3.56 and the average family size was 4.10. In the city, the population was spread out with 39.9% under the age of 18, 13.0% from 18 to 24, 30.0% from 25 to 44, 13.2% from 45 to 64, and 3.9% who were 65 years of age or older. The median age was 24 years. For every 100 females, there were 106.3 males. For every 100 females age 18 and over, there were 106.7 males. The median income for a household in the city was $31,196, and the median income for a family was $29,722. Males had a median income of $18,417 versus $20,682 for females. The per capita income for the city was $10,794. About 24.7% of families and 26.1% of the population were below the poverty line, including 29.1% of those under age 18 and 16.1% of those age 65 or over. ^ "Wendover, UT Population - Census 2010 and 2000 Interactive Map, Demographics, Statistics, Quick Facts - CensusViewer". censusviewer.com. Retrieved 2019-02-04. ^ Hall, Shawn (June 2, 2002). Connecting the West: Historic Railroad Stops and Stage Stations of Elko County, Nevada. University of Nevada Press. p. 196. ISBN 978-0-87417-499-1. Retrieved December 14, 2010. ^ "ATT, First Transcontinental Line". Archived from the original on 2017-09-08. Retrieved 2019-02-05. ^ Nielson-Stowell, Amelia (March 10, 2006). 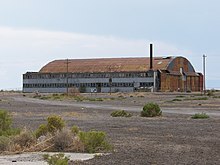 "U.S. grant to help Wendover Airfield". Deseret Morning News. ^ "Hotels near Wendover, UT". Google. Retrieved September 12, 2013. ^ Eddington, Mark (November 23, 2002). "Wendovers' Leaders Will Consider Next Move". Salt Lake Tribune. ^ "WENDOVER USAF AUX FLD, UTAH (429382)". Western Regional Climate Center. Retrieved June 5, 2016. ^ "Population and Housing Unit Estimates". Retrieved November 1, 2018. 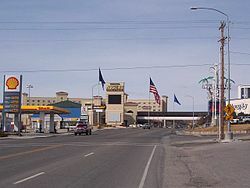 Wikimedia Commons has media related to Wendover, Utah.